Stop Destroying Your Nose Wheel Tires! Have you ever flown into an airport, taxied to the FBO, parked your aircraft, returned, taken-off, flown home and then found out that they have followed the instructions on the nose landing gear door? 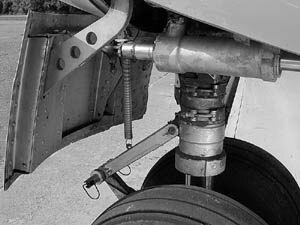 During ground movement of the aircraft, the torque link is disconnected, allowing the nose wheel to turn independently from the aircraft control systems. The torque link is attached to a stow block mounted on the upper part of the front OLEO. This torque link, if not secured properly, may fall down and be on the same plane as the nose wheel tires. When the aircraft is moved on the ground by an aircraft tug, the nose wheels are rotated to provide steering. Since the nose wheels turn, and the torque link does not (being attached to the control mechanism), the torque link interferes with the tires, either scuffing, cutting or even puncturing them. Insight’s torque link modification is designed to provide a safe, foolproof solution to the nose wheel puncture problem. 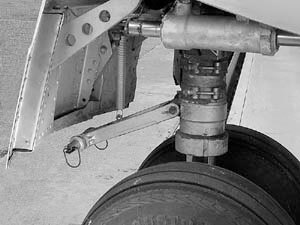 When the ground crew disconnects the torque link from the nose wheel, the disconnected spring loaded torque link will be secured up and out of the way of the nose tires, allowing proper ground movement of the aircraft. This modification to the front nose wheel replicates the system used by Mitsubishi on their long body version of the MU-2. The torque knee modification adds a significant safety factor to the aircraft as it eliminates the potential for cuts on the nose tires during ground operations, if these nose tire cuts are not detected they could cause a tire blowout during a landing.